Held during the first week of July, NAIDOC week is a time to celebrate Aboriginal and Torres Strait Islander history, culture and achievements. 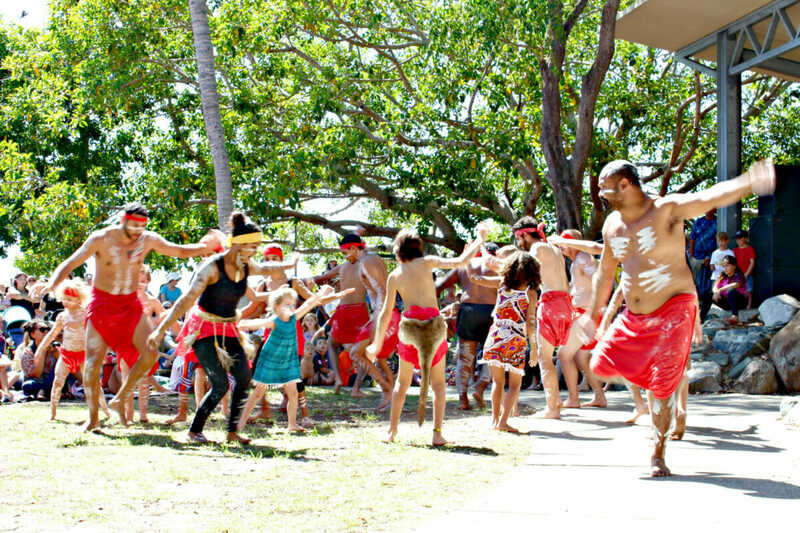 It’s also an opportunity to recognise the contributions that Indigenous Australians make to our country and our society with events and gatherings spread across the Sunshine Coast. Held at various libraries, there are cultural exhibits and demonstrations as well as a Family Fun Day in Maroochydore this Saturday, 8 July. The Nandjimadji Art Group exhibition showcases paintings by Aboriginal and Torres Strait Islander people living with disability on the Sunshine Coast. Free event and no bookings required. Visit council’s library website for more details. Paintings from Aunty Eve Kitchener, recognised local Elder and Aboriginal Dot and Symbol Artist – Wiraduri Tribe and from the Stolen Generation. The exhibition also includes various artworks that were gifted to Nungeena and Liza Bloomfield. Free event and no bookings required. Visit council’s library website for more details. View the intricate work of dot painting by members of the Nandjimadji Art Group. Artists will demonstrate dot painting skills and the application of traditional techniques using contemporary mediums. Free event and no bookings required. Visit council’s library website for more details. Aunty Eve Kitchener is a recognised local Elder and Aboriginal Dot and Symbol Artist. She is from the Wiraduri Tribe and the Stolen Generation. Hear Aunty Eve talk about her artwork which will feature in the Nungeena Women’s Exhibition which also includes various artworks that were gifted to Nungeena and Liza Bloomfield. Free event and light refreshments will be provided. Bookings via council’s library website. Join the local Aboriginal and Torres Strait Islander community to celebrate NAIDOC Family Fun Day. The theme, Our Languages Matter, highlights the essential role that Indigenous languages play in cultural identity, linking people to their land and water and in the transmission of Aboriginal and Torres Strait Islander history, spirituality and rites, through story and song. This event provides an opportunity to come together to share in culture, knowledge, good will. Free event. Visit www.naidoc.org.au for more details.